Born in Baku, Azerbaijan, Irina’s journey in dance began in classical ballet, training through most of her childhood. Irina and her family fled her native land for refuge in Providence, Rhode Island, where she attended public school, never missing an opportunity to join a performing arts or theater club. She continued to be exposed to tap, jazz and lyrical dance on stage, throughout high school. After earning her Bachelor of Arts at Roger Williams University, Irina became a high school English teacher in Providence–which she has loved–for thirteen years. During this time, Irina participated in various community theater groups, continuing to dance tap, jazz and ballet on stage. But it was not until she discovered salsa dancing that her passion for dance was rejuvenated. 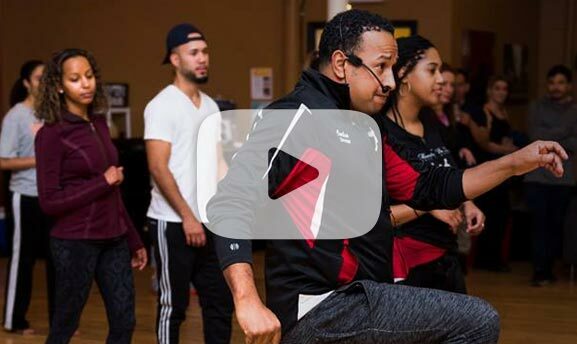 As part of the dance team for Providence based JJ Latin Dancers, and under the direction of co-director Kathia Elkhoury, Irina pursued training in New York City, taking classes with renowned Eddie Torres, Santo Rico and Yamulee. This training became instrumental in her growth as a salsa dancer. Her desire to seek other opportunities for growth, landed her in the beautiful space of Mambo Pa Ti, in Pawtucket, RI – under the direction of Carlos Gonzalez. Along with this hard working and dedicated team, she continues to seek dance training to ensure growth as a dancer, with world renowned professionals such as Oliver Pineda, Thomas Guerrero and Joel Masacote. For the past year, as part of Mambo Pa Ti, Irina has assisted Carlos in teaching both individuals, as well as large, small and private groups. She has performed on stage in congresses and at other events. She loves training and working with other teams to develop dancers, and has even begun a dance club for her high school students at Academy for Career Exploration, teaching teenagers Salsa and Bachata.